Ah, the wind in your face. Perhaps bugs in your teeth if you are wearing an open face helmet. Or none. And dust, and sand, and mud. And rain? Hail? I was once following a friend on our motorcycles. He was wearing a full face helmet and glasses, but had left the visor at home. All of a trice I saw twin streams of yellow goo streaming around the sides of his helmet. He slowed and stopped at the edge of the road. When I pulled up next to him he was laughing so hard he was crying. He had hit some sort of very juicy bug right on the bridge of his nose. The resulting bug death had left his entire face and glasses covered in glorious yellow slime. Oh, I wish I’d taken a picture. A number of years ago I was bombing along at an illegal rate of speed when suddenly a rock appeared in the air, right in front of me. It bounced off the Lexan face shield on my Arai helmet. I never figured out where it could have come from, and I reflected on what would have happened decades ago with my first full face helmet. That was an early Bell Star model, and the visor was some sort of thin and clear plastic. Such a rock would have gone right through it. Then there was the bee that hit me in the throat at a good speed, and stung me in his death throes. That hurt, although he more than me. So yes, there are arguments to be made in favor of having some sort of windshield on your motorcycle. But what kind? Your selection will be based on your perceived needs combined with your model and style of bike, and probably your sense of what looks “right.” You have several types to choose from, and we will go from small to large in order. None at all. To me, a lot of bikes look best when they are simplest. Think of classic designs such as the Harley Sportster, any of the British bikes, most Ducatis, and early BMWs, at least as delivered. They are cooler on hot days, and cooler looking on any day. Flyscreen. This is the smallest, and is almost entirely non-functional. It came to fame, I think, back in the late 1950s and early 1960’s, as they were attached to many British sporting models, particularly the “café racers” of the day. This is simply a clear or painted small shield of two to six inches high that sticks up from the upper edge of the windshield. Some are merely a three or four inch “lip” added to the top of the headlight. Having said they are useless, they do make a noticeable difference in wind blast, much more than you would expect. If you also have a tank bag on your bag, the combo provides some protection. Of course, this is my favorite. I had one on my Speed Triple, that was sort of a cross between a fly screen and a bikini fairing (next section) and I felt that with the bug eye headlights of the Speed Triple it was an absolute necessity. I just ordered a fly screen for my new Bonneville, in the same killer cranberry metallic color that is on the fuel tank. At times a manufacturer will put a fly screen on to give the bike a racier appearance. One example is the Harley-Davidson XLCR of 1977. Every once in a while Harley produces a “sports bike” and they usually miss the mark. It seems that the finer minds in Milwaukee just cannot wrap their minds around the concept of cornering and a forward lean position. They made a sporting version of the V-Rod a few years ago and it was a very nice bike, but too heavy and much too expensive compared to the competition. We had one at Cycle Barn that had been crashed very early on, and the custom shop recreated it with some Aprilia and other parts, and it was what Harley should have been aiming for. Still too expensive, although I was tempted. In any case, Harley customers never buy these forays in large numbers anyway. Harley even went so far as to produce a drag racing bike that came from the factory with wheelie bars and a drag slick. It was not street legal, and the intent was that thousands of loyal customers would purchase them as a way to get into drag racing at a reasonable cost. Can you imagine that customers did not define $42,000 as a “reasonable” cost? I recall that the sales manager at the time ordered one and nearly had his head removed. It was there for a long time before disappearing without a murmur. Bikini fairing. Next up in order is the bikini, which is about half of a race fairing. It wraps around the headlight and usually but not always has sides that extend back toward the tank. These will usually require clip-on handlebars, or at least lower ones. You can find them on several Ducatis of the 1960’s and 1970’s. Best known is probably the BMW fairing used on the R90S. A masterpiece of minimalist design, and sold as aftermarket copies even today. I purchased one from a fellow who had installed it on his Ducati Darmah for a mad dash to New York and back for his sister’s wedding. He installed the fairing and an air bladder seat pad, rode almost non-stop to New York, put on a tux for the wedding, and rode back. Then he sold it to me for $100, with 6,000 miles of bugs added for free. With small brackets made by a handy friend, it served my Yamaha 750 triple very well for over 20 years, and was still in place the last time I saw it. Full race fairing. This stretches the concept of “fairing” a bit, as these are used on road racers where aerodynamics is a key factor. They do provide a little bit of protection if the rider is in a full racing crouch. Of course, when so positioned, the racer has little forward vision at all, but hey, it’s all about the speed. Far more often, it’s all about the look of speed. Certainly for me when I owned a very rare Muzzy 750 Raptor. To see at all I had to change from a Shoei helmet to an Arai, because the viewing port is higher in an Arai. I also had to avoid a lot of clothing at the back of my neck, to allow me to bend my head back far enough to see where I was going. Not practical at all, but wow – did I LOOK fast! Anorak note: Craig Vetter is usually credited with creating the touring market with his “Windjammer” large fairing, back in the 1970’s. What few recall was that this was not his first product. The initial batch was essentially full race fairings with an extended windscreen that rose up several inches higher. I thought it was terrific, and as an impecunious college student I spent $140 of my meager funds on, if I recall, Vetter fairing #43. I mounted it on my Yamaha 250 YD-S 3. I also purchased a small diamond engagement ring at the same time for almost the same cost. The engagement lasted two weeks, which in retrospect turned out to be a very good thing. The fairing contacted the brace on the back of the front fender, so I simply took off the fender. Even racier! In white, it matched the white on the fuel tank. To pick up on the blue on the tank, I mounted two large blue decals, one to each side, which displayed the Yamaha crossed tuning forks logo – the original company logo. Gorgeous! A proud moment in my life came when I was outside of the house where I rented a room, waxing the bike for the 43rd time. A fellow on a BSA roared up and stopped. He asked me if I was entering the road race that weekend and I think my ego swelled my head to twice its size. 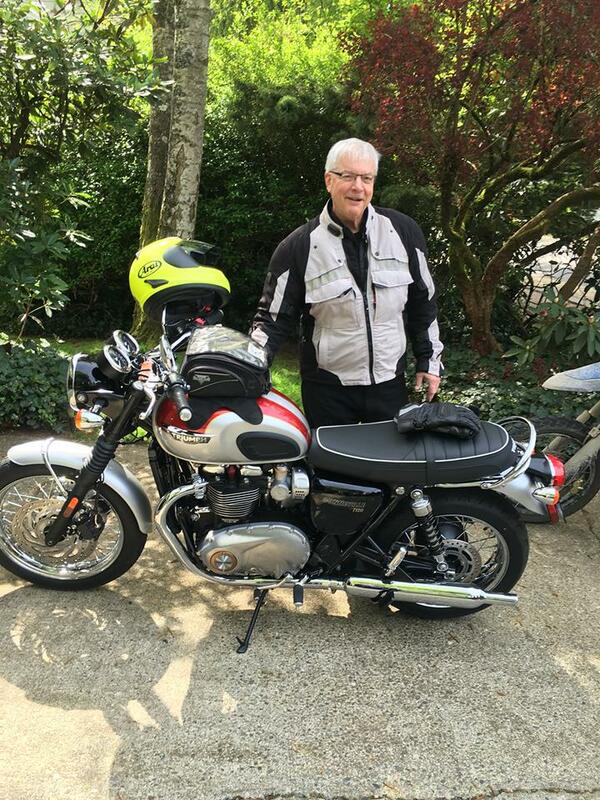 After two years and several thousand miles, including a memorable ride from Minneapolis to Seattle and back in 1968, I moved all of my meager possessions, and the Yamaha, to Seattle, using a two axle Hertz enclosed trailer. Once in Seattle, I removed the fairing for (another) thorough cleaning. Then I took my pristine machine out for a test ride and promptly threw it into a ditch at about 60 mph, my only serious crash in 50 years. I sold the remains of the bike and the still pristine fairing to a guy who lived next door and promptly lost track of the guy, the bike, and the fairing. A pity, as that fairing is now probably worth some serious bucks to a collector of the odd and unusual. Bar mounted fairings. By far the most well-known is the Harley-Davidson “bat wing” fairing, in use for far more than a half a century. I’ve always thought them ugly, but what do I know? People keep buying them, and you can tell what kind of bike it is immediately. I have no idea how many beers he had consumed, but that dude could ride! Windshields. Here is a conundrum. Many of my friends swear by these, but more often I swear at them. In my experience, almost all of them trade protection from wind and rain and cold for snapping and turbulence and a lot of noise. This is an improvement? Really notable exceptions are the windshields on Harleys. A Road King offers all the benefits of the windshield with no downsides. I do not know why Harley seemingly alone can figure out the ergonomic requirements for a screen that offers protection with no drawbacks, but they obviously know something others don’t. I’m always amused by people who dump all over Harleys as slow bikes with antiquated technology. Most of them have never ridden a Harley, and my guess is that many have never ridden a motorcycle. A Road King on a winding back road is a sublime experience. Harleys also had smooth and simple cruise controls long before others offered them, as well as other little techno goodies. Touring fairings. Sport touring bikes such as the Yamaha FJR and Kawasaki Concours now offer a windscreen that is adjustable, either manually or electrically. The BMW version is pretty trick in that when the ignition is turned off the windscreen comes down and provides protection and security for the navigation system. Others, such as the Honda Goldwing, offer a windshield that is adjustable only by hand, which seems odd until you see how simple it is. In today’s market there are a myriad of variants on all of these themes. Odd ball takes, variants, outliers, taller, shorter, and that is before you check the aftermarket suppliers. So there you have it. How much coverage do you need? Or, how much do you want? Me personally, the visor of my Arai is about it. I always know where the wind is coming from. This entry was posted in Marketing, Motorcycles. Bookmark the permalink. I ride a 2009 Honda Shadow Spirit 750. I look dumb enough with my ‘hi viz’ Tourmaster jacket and white Arai helment with a full reflectorized face shield, so I don’t want to jack up the dumbness factor by adding a windshield to my bike. I want to look as sporty as I can while being visible and protected. Thanks for your post. It should be obvious that the angle of attack of the windscreen has a dramatic effect on the shape of the laminar flow and the envelope created by it… I have found this to be a critical aspect of employing a windscreen of any form… Larger screens, if not positioned with attention to the aerodynamic potentials, can act as a sail at the most inopportune moment when riding in high-wind conditions, where wind-gusts push from a direction behind the screen…. This same angle of attack will impact where the buffeting will occur at your helmet and body, especially with a short windscreen that does not create a wider and taller envelope.